The entire Konkan belt receives heavy lashings of rain in the 3-4 months of the monsoon season. During the rainy season, the seas are choppy & the weather is stormy. The fisher folk take a break as deep sea fishing comes to a standstill which allows the fish to breed. Well, it is time to use your stock of dry fish for various preparations during the heavy monsoon season. Now, while some states have laws against fishing during the monsoons, deep sea fishing with mechanized trawlers does continue & the lucky ones can indulge in fresh fish & seafood! However, the Konkani & Goan palate cannot do without fish & seafood. So the entire Konkan belt especially Goa, stock up on dry fish in the month of May before the onset of the monsoons. Fish like prawns, mackerel (bangda), Bombay duck (bombil), shark fish (mori), etc. are salted & dried under the sun by fisher folk during the summer months for consumption during the monsoons. A variety of dishes are made with dry fish. You get two varieties of dry prawns – Sungata which are larger prawns & Galmo/Jawala which are tiny dry prawns. Sungata needs to be cleaned i.e. you have to snip off the heads, legs & tails while Galmo/Jawala can be used right away without snipping but it needs thorough cleaning… you need to sieve them because they are dried in the open on the seashore & may have sand & fine stones mixed in them. It is very important to sieve & then also do a manual cleaning to check for any left-over tiny stones or any other particles & then winnow them to remove the dust. Now, cleaned & well packaged dry fish are available in the super markets & grocery stores & so saves the trouble of cleaning. Kismur is a traditional Goan dish which is an all time favorite. You could call it a dry fish salad or just an accompaniment/side dish. 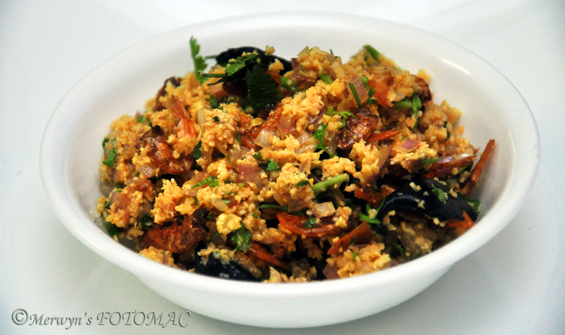 Kismur can be made with dry prawns or shrimp, mackerel, shark, surmai (king fish) etc. It is also known as Kismuri. My grandmother used to make Kismur using all types of dry fish which we would enjoy with pez (Goan Parboiled Rice Gruel) & with Sorak (a red coconut based curry with or vegetables). I make Kismur with Sungta as well as with Galmo. For the authentic taste, the coconut oil is a must which I do use. Today, traditional cooking methods & traditional food is back in the limelight. It feels good to see the simple & humble Kismur which is a part of our daily diet & is an integral part of the day-to-day meal served in every Goan home, is given a pride of place in five star restaurants & served at buffets/banquets. Tourists can enjoy Kismur as it is very often included in traditional Konkan thali meals. 1 tsp. Red Chilli pwd. Soak the ball of tamarind in some warm water & extract pulp. Set aside. Clean the prawns by snipping the heads, legs & tails. Roast the prawns evenly on a hot tawa/griddle on a low flame with oil. Keep stirring continuously & when light brown, take it off the flame. The prawns are well done when they turn crisp & you get an unique aroma of roasted prawns. Let it cool & then cut into 2-3 pieces each depending on the size of the prawns. If they are small prawns/shrimps (Galmo/Jawala) then there is no need to cut them. In a sufficiently large bowl, mix together freshly scraped coconut, red chilli pwd., turmeric pwd., tamarind pulp, Kokum (Sola) & salt to taste. Crush & mix well with your fingers. Set aside till serving time. Remember the dry fish is already salty so use salt sparingly. Just before serving, add the roasted prawns, chopped onions to the above coconut mixture & combine till well mixed. Serve on the side with hot rice & curry. It is better to use small prawns/shrimps/Galmo/Jawala as they are tastier. Coconut oil enhances & brings out the flavor in the Kismur. Kokum adds a good flavor & enhances the taste of the Kismur but you can substitute with tamarind or use a mix of tamarind & Kokum as per taste. If you do not like raw onions in the Kismur, you may use lightly roasted onions in oil. To retain the crispness & freshness of the Kismur it is important to mix the roasted prawns & onions just before serving. If you do not have tamarind or Kokum at hand then you may add a dash of vinegar but it depends purely on personal taste. Kismur my all time favourite.. Thats one dish that I order on all the days that I am in Goa and glad I can make it now at home and have it whenever I want it.